Back in 1853, in a Saratoga Springs restaurant, this curmudgeon of a customer who was very wealthy, hard-to-please and in a bad mood, ordered some food. The guest decided that his fried potatoes didn’t meet with his expectations. They were supposedly too thick, too soggy and without enough flavor. The chef was himself a bit of a testy character when it came to his culinary acumen, and so he was determined to teach this annoying patron a lesson. Too thick, soggy and flavorless? he thought. I will show him! So this chef decided to slice potatoes so thin that you could almost see through them. Then to add insult to injury, he over cooked it by frying it to the point that if you tried to cut it with a fork it crumbled. Finally, the chef thought he would over season it to the point that it was caked in salt. News of this crispy confection created for this culinary curmudgeon spread. 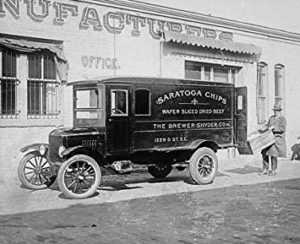 And the new side dish gained not only popularity but a name, “Saratoga Chips.” Believe it or not, the chef’s revenge creation became so popular that it brought about a great deal of celebrity to the chef, George Crum, who ended up opening his own restaurant. Today, that culinary act of vengeance has given birth to the billion-dollar snack industry.